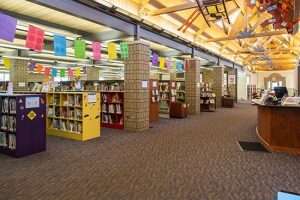 Benson Branch will be closed January 20-March 5 for new carpet installation. Limited basic services will be available January 29-March 5, in the meeting room, Tuesday-Saturday, 10 a.m.-6 p.m. Services available include check outs, material returns, hold pick ups, and Wi-Fi service. Patrons will be able to use the drop boxes to return materials while the branch is closed. Storytimes will continue at the Benson Community Center, 6008 Maple St., during the time that the library is closed. A schedule of programs may be viewed here.